Smoke Chief turns anything into a smoker. This cold smoke generator makes a major amount of smoke & it's easy to use. Just add a Cup of BBQ pellets for up to 3 hours of continuous smoke. Easily connect smoke Chief to any smoker cabinet or grill. Pour in pellets & close the lid. Plug the unit into household current or 12V automotive power. Turn smoke Chief on. In less than 2 Min you will be "blowing' smoke". smoke Chief works with any Brand of BBQ pellets but smokehouse BBQ pellets are recommended for best results. 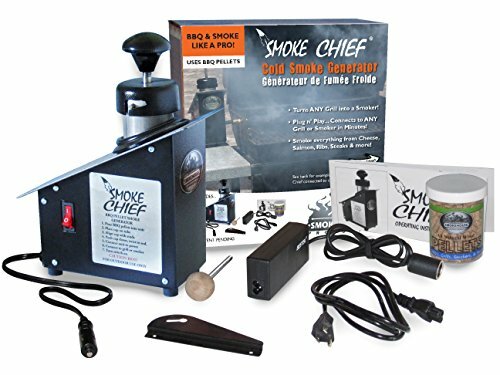 The smoke Chief package includes everything you need to immediately put smoke Chief to work; smoke Chief smoke generator, 110VAC/12VDC power adapter, smoke Chief hanger, clean-out tool, 8oz measuring jar (filled with smokehouse BBQ pellets) & instruction/recipe book. Recommended for outdoor use only.